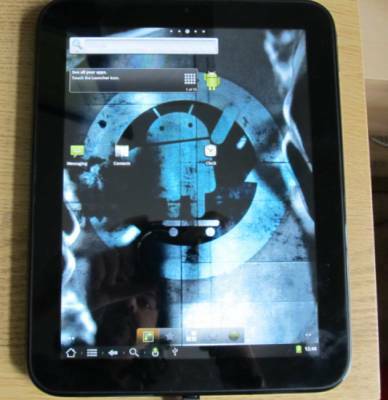 The CyanogenMod team has released the first public build of Google Android for the HP TouchPad tablet. Right now the software is still in the alpha phase, which means that not everything works as it should. There are still bugs with the Bluetooth, camera, and other functions, for instance. But for the most part, the operating system is now up and running on HP’s discontinued tablet and anyone can install it. While the HP TouchPad originally shipped with webOS 3.0 software, the tablet’s hardware is similar to many Android tablets. Since the future of webOS is uncertain — and right now there are hundreds of thousands of apps available for Android and less than 10,000 apps for webOS, many of the people who picked up cheap HP Touchpads when HP discontinued the tablet in a $99 fire-sale have been looking forward to installing Android. The steps below will help you to do just that. This will create a dual-boot setup, allowing you to switch between Android and webOS. Again, this is alpha software, and things can go wrong. 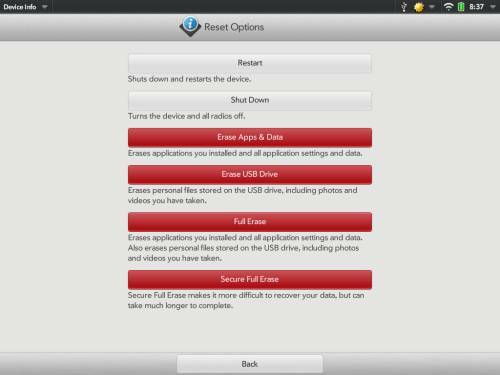 You’ll also lose music or other media stored in webOS when you follow these steps. The current version of CyanogenMod for the TouchPad is based on Android 2.3.7. Once Google released the source code for Ice Cream Sandwich, developers will start working to port it to the TouchPad, but that work could take several months to complete. Update 1/18/2012: CyanogenMod 9 Alpha 0 has been released. While it’s still pretty rough around the edges, this is the first build of Android 4.0 publicly available for the HP TouchPad. You can install it by following our step-by-step instructions. They’re similar to the instructions below, but there are a few key differences. Update 12/15/2011: CyanogenMod released Alpha 3.5 of CyanogenMod 7.1 Android for the HP TouchPad. The only real change to the install process is that you now download the alpha 3.5 file instead of the Alpha 1 file. The rest of the steps remain unchanged. If you’ve already installed CyanogenMod Alpha 1 and you want to know how to upgrade to Alpha 3.5, you can follow our step-by-step instructions. You’ll likely be able to apply future updates following the same steps. 1. Download and install the Palm Novacom software for your computer. You can find grab the latest software for Windows, Mac, or Linux from the HP website. 2. The next step is to download three files from the RootzWiki forum and one more file from the Moboot project. If you want to install the Google Android Market and Google apps such as Gmail and YouTube (which you probably do), you’ll also want the gApps installer for CyanogenMod. You can download it from goo-inside.me or from the CyanogenMod wiki. 3. 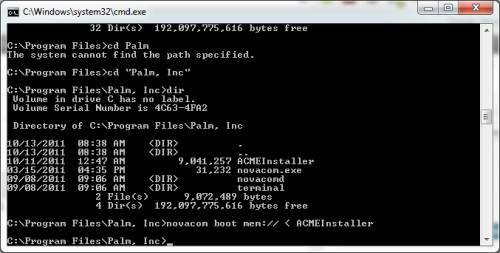 Unzip the ACMInstaller file to the same directory where Palm Novacom is installed. On my computer that directory is C:\Program Files\Palm, Inc.
4. Connect your HP TouchPad to your computer with a USB cable. 5. On the TouchPad you should see a USB notification. Tap the symbol to mount your tablet as a USB mass storage device on your computer. 7. Copy the update-cm-7.1.0-tenderloin-a1-fullofbugs.zip, update-cwm_tenderloin-1012.zip, and moboot_0.3.3.zip files into that directory. If you’re also installing gApps, drag tat file to the cminstall folder as well. Do not unzip these files first. Tap the home button and then hit the arrow key to bring up a list of applications. Select the red Reset Options button at the bottom. Tap the Restart option on the following screen. If you want to install the Google Apps including the Android Market and Gmail apps, scroll down to the bottom of this article for details on how to add those features. 9. As soon as the screen goes dark, start holding the Volume Up button — don’t let go until you see a big USB symbol on your display. 10. Your computer might take a moment to recognize the TouchPad. Type “cmd” (without quotes) into the search box. A terminal window should open up — but you’re in the wrong directory. Type “cd c:\” and press enter to get to your root directory. To navigate to the correct directory, type “dir” and press enter to see a list of directories. On my computer, I next typed “cd Program Files” and hit enter, then “cd Palm, Inc” and hit enter again. 12. Enter the following command (without quotes) and hit return: “novacom boot mem:// < ACMEInstaller”. That’s pretty much it. For the next few minutes you should see text flying across your screen. When it’s done, the HP TouchPad will boot Google Android. Then select “reboot to webOS” from the next menu. Note that you’ll only be able to reboot to webOS if you’ve installed the “moboot” file as described above. 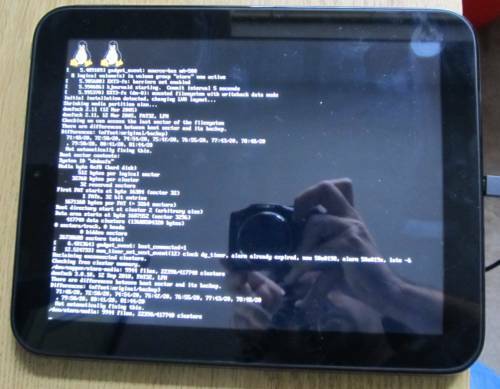 This method installs the open source CyanogenMod 7.1 version of Android on the tablet. It’s based on Google Android 2.3.7 software. Download the latest gApps package for CyanogenMod 7 from goo-inside.me or from the CyanogenMod wiki. Copy it to the same “cminstall” directory on your TouchPad where you placed the CyanogenMod installers. Run the ACMEInstaller program again from your computer — or you can try adding gApps during your initial installation. If you’re familiar with using ClockworkMod Recovery, you can also place any update files in the root of your device’s storage and reboot into recovery from Android and use ClockworkMod to apply updates. Note that the first time you boot after installing gApps you may want to hit the “cancel” button instead of signing in with your Google account right away. That way you have time to connect to a WiFi network before the Android Market tries to load the list of available Google applications. Even if you do install the Android Market, you may find that some of your favorite apps aren’t listed. I couldn’t find the Facebook, Twitter, Google Maps, or Dolphin HD web browser apps when I searched the Market for them on the TouchPad. This is likely because the Android Market doesn’t think they’ll be able to run properly on the TouchPad’s hardware. They will. You just need to install them manually. If you have a rooted Android phone or another device you can use an app such as Titanium Backup or ROM Toolbox to create backup copies of any apps installed on your device. You can then email them to yourself or copy them to your tablet using another method. I was able to successfully install all four apps listed above. They don’t all look great on the TouchPad’s 9.7 inch, 1024 x 768 pixel display, but they do run. Update: There’s an update that fixes the problem with the Android Market that had prevented certain apps from being listed. If you’re running CyanogenMod 7.1 Alpha 2, then the Android Market fix should come pre-loaded. If for some reason you’re still using Alpha 1, there are two ways to install the Market fix. Connect your tablet to your PC via a USB cable and mount your tablet as a USB mass storage device. Copy the update file to the root directory of your device. Press and hold the power button on your tablet. Select Recovery from the next menu. Your tablet will reboot to ClockworkMod Recovery. Tap the home button to select that option. Use the volume keys to scroll down and select the update file. Tap the home key to select. From the next menu, use the volume keys and home key to select the “yes” option. After the install is complete, press the power button to go back to the main menu, and tap home to reboot your system. Connect your tablet to your computer and mount it as a mass storage device. Create a folder called “cminstall” on your device. Copy the update file to that folder. Reboot your device into recovery mode by restarting the tablet and holding the Volume Up button until a big USB icon appears on the screen. Follow steps 11 and 12 in the tutorial above to open a terminal, navigate to the Palm Novacom/ACMEInstaller directory, and enter market “novacom boot mem:// < ACMEInstaller” to start the install process. Once you’ve done that, you should be able to find Google Maps, the Dolphin HD or Opera web browsers, or other apps in the Android Market. If you’re wondering exactly how the ACMEInstaller works, you can read more about it at the CyanogenMod blog. Basically, the app resizes the webOS media volume to create space for Android system, cache, and data volumes. It then installs CyanogenMod, the Moboot bootloader, and anyother files such as the Google Apps. This is why using the installer tool will erase any songs, photos, or other media stored in your HP TouchPad webOS media directory. The good news is that CyanogenMod 7.1 for the TouchPad will then treat the webOS media area as if it were an SD card — so you can access webOS media from Android, or access your Android files from webOS. If you followed the instructions and put Moboot and ClockworkMod Recovery in the cminstall folder when you first flashed Android you should be able to use the “reboot to webOS” option to restart your tablet in webOS. If not, you can only reboot to Android — but don’t worry. There’s a way to fix this. While in Android, connect your tablet to a computer via a USB cable. 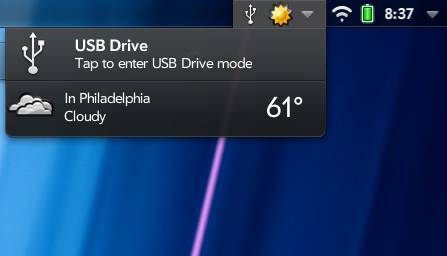 Your tablet should show up on your computer as a USB disk drive. Place Moboot, Google Apps, or any other file you need to flash into that folder. Reboot your tablet while holding the Volume Up button to enter recovery mode. From your computer, follow steps 11 and 12 from the installation tutorial again to open a terminal, navigate to the novacom folder and use the “novacom boot mem:// < ACMEInstaller” command. That should send the new components over to your TouchPad and the next time you boot you should have the missing features such as the ability to enter ClockworkMod Recovery to select your boot options. Unzip the update-cwm_ternerloin-1012.zip file to the same director where Novacom and your ACMEInstaller files are located. Connect your TouchPad to your computer and reboot into Recovery by holding the Up Volume button while you reboot. Open a terminal and navigate to the Novacom directory. First, make sure your device is really frozen. The install process can take a while, so it might look like nothing is happening even when there’s activity. But if five or six minutes pass and you find yourself looking at blank screen, try pressing and holding the power button and home button at the same time for about 30 seconds. This should cause your tablet to reboot. CyanogenMod 7.1 for the HP TouchPad is still alpha software, which means it’s still pretty rough around the edges. One of the biggest problems users have found is the so-called “sleep of death,” which basically means that from time to time the tablet will fail to resume from sleep when you press the power button. One possible fix for this is to install a software patch that should eliminate or at least reduce sleep of death instances. You can find details on how to do that in our article about the sleep of death. If you royally mess things up you can also try to restore your system to factory default condition using the webOS doctor. The folks at webOS Internals have put together a nice set of instructions for doing that. If you just use the webOS doctor to restore webOS, you won’t actually erase Android or change the storage partition size — which means the space in your media partition that was allotted for Android will still be inaccessible. But the CyanogenMod team has released a tool called ACMEUninstaller which you can use to completely remove Android and change your partitions back to their normal size. Just download the latest version from the link at the RootzWiki forum, unzip the app to your Palm Novacom directory and run it the same way you would run the ACMEInstaller app. Bonus round: If Android isn’t your thing, you can also install Ubuntu Linux on the TouchPad. Note that while it’s pretty hard to completely “brick” the tablet and leave it entirely unusable, it is possible to do so. Installing Android may void your warranty — especially if you’re unable to restore the tablet to its factory default settings. So please proceed at your own risk, and understand that neither Liliputing nor the developers at CyanogenMod can be held responsible if something you do to your tablet causes it to stop working properly. I’ve really been looking forward to this, but will probably hold off until its out of alpha stage. Nice of you to put up a how to however you need to proof it–there are some mistakes. There are some things that are unclear–as if you just jumped form one thing to another. Like restarting/resetting the device but it’s still hooked up to the computer? Which reset option should they choose? You know noobs will try to follow this and brick their device if it isn’t spelled out to the T step by step. Yes, you can reset it while it’s still connected. I did miss the bit about choosing “Restart” though. I’ll fix that. So looks like I am the noob that folled the instructions to a T, it said to select the Bottom Red Reset button, that one says Full secure Erase…..
– Select the red Reset Options button at the bottom. -Tap the Restart option on the following screen. Can I assume, I’ll have to rebuilding my TP when it gets done erasing everything? 2. Tap the Device Info item. This just reboots your device. That’s all. It won’t erase any data or esettings — although this process *will* delete any photos, music, movies, or other data in your /media partition. Brad… I was having the same problem with not getting the boot screen when you first turn on the Touchpad…. What worked for me is unzipping the MOBOOT file and installing that in the “cminstall” folder. Now it works like a charm. Also…. gapps loads up perfect as a “new” install if you include it on the original Android install. Enjoying Netflix right now! Luv it! Thanks for your write up…. it’s cleaned up alot…. I’m curious…. am I the only one who lost the data on the removable drive (/media)? Nope, that’s a known issue as pointed out above. Thank you…. I am trying to load this on a mac – have downloaded everything, and installed zips on touchpad. Can you tell me how to run the ACMIinstaller where the Palm Novacom directory is located? I’ve rooted my phones – etc., and have some knowledge on how to proceed. Thanks again..
Lmcintyre–do you mind posting where you extracted ACME INstaller on your Mac? I dropped it into the application contents, but that doesn’t seem to be working for me. Unfortunately I’m not really a Mac guy, but what you need to do is copy the ACMInstaller to the same directory where the Palm Novacom files are stored — then open a terminal, navigate to that directory and run the command shown in the instructions. The steps for doing this will vary from Mac, to Linux, to Windows, but the basic idea is the same in all three situations. The funny thing is on window you have novacom in program<palm inc folder where you put acmeinstaller. but on Mac there is just applications<palm. I wonder if novacom is in a different folder. Can't find it! can anyone with Mac help us? Thank. And by the way,Brad, this site has the best article on this subject! I changed my mind after reading this at rooztwiki:Note: Alpha1 is an extremely rough build. Expect more crashes than you can count. I got android installed on my touchpad using those instructions above, but I cannot get through the google user setup because wifi configuration is failing. Are touchpad wireless drivers included in this release? They are, but you might have to cancel the Android Market setup when it first pops up — then manually go into the settings, enable WiFi, connect to your network — and *then* either launch the Android Market or go to the Accounts menu to login with your Google username and password. can find grab the latest software for Windows, Mac, or Linux from the HP website. I did this and I am able to start and test the WEB OS emulator fine. However, I am pretty sure there is no directory called Palm on my system. At the link above in the Linux section there is a specific reference to Novacom that is not mentioned in the Windows instructions. What am I missing here. Do I need to perform an additional install for Novacom? To navigate between the menu choices I have to use the volume control. To select, I use the home button. Interesting I can boot to WebOS fine, so I haven’t bricked it. Android just failed to install properly is all. That’s odd. It looks like moboot and clockworkmod installed properly. Are you sure you had the correct CM7 file in your cminstall folder as well? All told there should be 4 apps, and the one it seems like you’re missing is update-cm-7.1.0-tenderloin-a1-fullofbugs.zip. It’s also possible that there’s something I’m missing because you’re running Linux and I was running Win7 though. No, I am running Windows 7, 64bit. I am pretty sure I got all the files and renamed the ones required per your instructions. The one thing I found confusing from the rootzWiki is, what is the difference between CM7 and Clockwork recovery? Is it just a mirror site, because the links had files with the same name. I used the CM7 files. Ahh… that might be your problem. There are two links each under CWM and CM7. The original source and a mirror in case the first link is no good. You need to download from one of the links under each. If you only grabbed CWM or CM7, it’s not going to work. Yeah, those are the files in my working directory. Anyway, I will revisit my steps. and try again later. Okay I am up and running with Android now. I first tried to run an update from the Clockwork recovery using the update feature and the fullofbugs zip file, and I thought it worked since it added a menu item to moboot, but it never would finish loading. I then used the AMCE installer again with just the fullofbugs.zip file and and after a reboot or two it finally loaded Android. Thanks.